Each year, nearly 800,000 people in the U.S. experience a stroke, and almost 90 percent of those are ischemic strokes in which a clot cuts off blood flow to part of the brain. To prevent further injury, blood flow to the brain must be restored as quickly as possible. In a new study, researchers show that non-invasive optical sensors can provide clinicians with real-time feedback on whether clot busting treatments are restoring blood flow. The technique, which monitors blood flow and oxygen levels in the brain, could also reveal early warnings signs of neurological complications after a stroke. 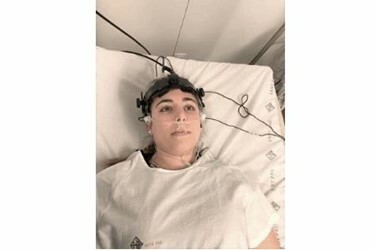 “We hope that providing individualized management of stroke patients with novel optical monitoring systems such as the one we developed will improve the chances of recovery and, consequently, reduce the direct health care and socio-economic burden of this prevalent condition,” said research team leader Raquel Delgado-Mederos of the Stroke Unit at the Hospital de la Santa Creu i Sant Pau, Spain. In The Optical Society (OSA) journal Biomedical Optics Express, the researchers report on field tests of their new compact and user-friendly optical sensing system, which is designed for clinical use in hospital emergency departments. They demonstrated their system by using it at the bedside of stroke patients to detect, in real-time, the effectiveness of a clot-busting drug in improving blood flow to the brain. Currently, most clinicians assess blood flow in the brain using measurements taken at single time points with magnetic resonance or computed tomography. These measurements are usually performed at the time of emergency department admission to help guide a doctor’s treatment decisions. Although a method called Transcranial Doppler can perform continuous monitoring, it only measures blood flow in large vessels and doctors must undergo special training to learn how to use it and interpret the results. The optical monitoring technique is based on diffuse correlation spectroscopy (DCS), which determines blood flow by analyzing fluctuating dark and bright spots, or speckles, produced by laser light traveling through the tissue, including the blood vessels. Combining DCS with near-infrared spectroscopy (NIRS), adds information about the amount of blood in the brain tissue and how much oxygen it carries. The combined DCS/NIRS approach was developed by the paper’s coauthor Turgut Durduran and colleagues at the University of Pennsylvania in the 1990s. Later, at ICFO - the Institute of Photonic Sciences, Barcelona, Spain, Durduran’s group developed user-friendly devices that have allowed the technology to be used as a research tool in hospitals and health care centers around the world. Bringing what was previously a research instrument into the challenging clinical setting of the Emergency department required the researchers to adapt the system for very fast implementation. The compact and user-friendly DCS/NIRS system they developed consists of two optical probes placed on the patient’s forehead. These probes contain custom-built fiber optics to deliver light from an infrared laser, which can travel through the skin and skull to reach the outermost layers of brain. Part of this light scatters back to the surface where it is detected by the optical fibers and used to gauge blood flow and blood oxygenation in the small vessels in the brain. They tested the optical monitoring system on five patients admitted into the emergency department with an acute ischemic stroke and who were treated with tissue plasminogen activator, a drug that dissolves the clot to improve blood flow. They used the system while the treatment was administered and then followed its effect on blood flow and oxygenation. The new study showed that it is feasible to use DCS/NIRS optical monitoring to assess blood flow and oxygenation in the brain after a stroke. The researchers plan to replicate the study with more patients at various clinical centers and under different scenarios to better understand the technique’s performance. They also plan to develop user-friendly software and probes to facilitate large-scale implementation of the system in fast-paced clinical environments. Spin-off companies, including one from ICFO, are also working to commercializing the technology and to raise funds for clinical trials.